Going through some files on my computer I came across some old Banana Republic ads I had scanned and saved. They still seem rather beautiful and timeless. Photos by Koto Bolofo -- one of my favorites! 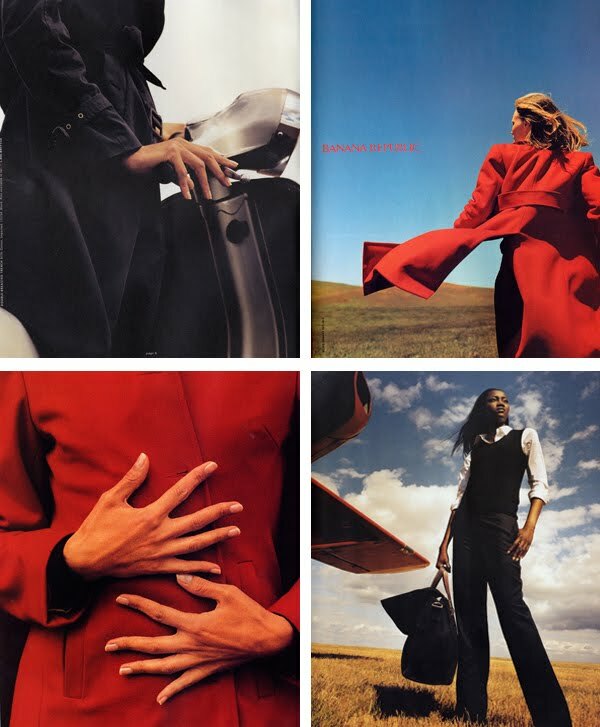 I have a tear sheet of the close up of the red coat. One of my favorite advertising images. How old are the ads? The clothes look timeless. It looks like an ad that could still run today. ah man...when Banana was REALLY GOOD. what happened? it's just not there anymore. I wish I knew the photographer and the year that these ran! Any ideas readers? I love rummaging through old catalogues. Great find! I think bananna republic should revisit some old styles....I haven't found anything in there I have wanted in so long. There is something to be said about classic style. I used to visit a secondhand shop near my house that always had a bunch of old Vogue magazines from the 80s and 90s. Gosh, the ads were just fantastic. I loved collecting them. Chanel and Ralph Lauren were my favourites. these are beautiful. i LOVE that top one. It's hard to go wrong with classic Banana Republic--so sleek and simple. The clothes are fashionable forever! Love. I cannot even tell they are 'old' which is why I love their clothes. LOVE them. Finding old ads always transforms you to a different place. Classic styles, alas, the quality has gone down hill over the years. These are gorgeous and timeless. It feels like the whole world has changed since these came out, they seem so, so something I just don't see much of anymore. There's a feeling that just seems a little more gracious and noble than the world we live in now. They are timeless. That's what makes them so great. Agreed. They had the right look back then, and haven't lost it one bit. Love this. so pretty, I actually think I have that tomato red jacket. a gift from my not yet husband back in 2001 I believe? truly timeless images I love them! believe it or not, i still have this catalog! just dug it up from my print archive and there's no date or photo credit. but it does say "postmaster: please deliver between august 26-28". lol! I love finding things that are timeless. These are so great! I LOVE those ads! I rememeber ripping them out of magazines back in the day - gorgeous color! Rachel – these photographs are by Koto Bolofo. Early 2000s. Thanks Anonymous! I knew they looked very familiar, he is one of my favorite photographers.